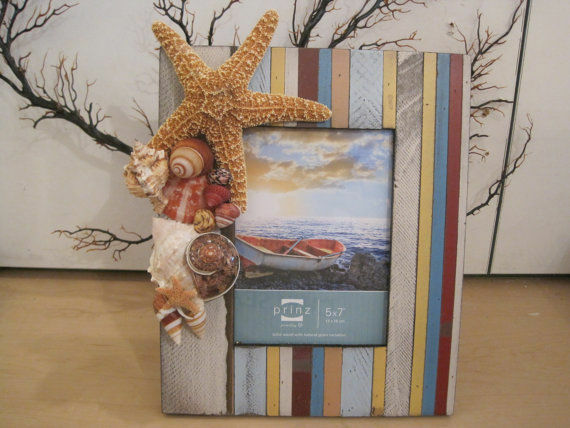 A stunning sugar starfish accents the top corner of this pretty and natural looking frame. Made with barnwood slats of brick red, light blue, light yellow, grey and cream stripes, this fun frame has the perfect beachy look! I also added a pectin shell, an apple murex, a turbo petholatus shell, striped snail shells, a mini sugar starfish and lots of fun patterened shells. This would be a great frame to hold a picture from a beach wedding or to frame a favorite day at the beach! The frame measures 11 1/2 x 9 1/4 with the picture opening of 5 x 7.